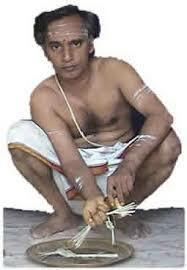 Gothras among Brahmins is considered as a patrilineal lineage. It is believed that all Gothras among Brahmins originate from Seven sages viz. The entire population of Brahmins according to our present belief is the paternal progeny of their sons .The Word Gothra means “A place where cows are tied” . It is well known that the wealth of people in the Vedic period was measured by the cows that were possessed by him. So there is a theory that these great sages used to maintain huge number of cattle in their hermitages and had large number of people in their hermitages to assist them. So possibly the Gothras that we refer may be the families of all the people living in the hermitage of a great saint . (It is interesting to note that there are Pravara(most eminent) rishis ,Different Gothras have 1-5 pravara rishis associated with them,) The need for this type of thinking is because as at present same Gothra people follow several Vedas , Several Grihya Suthras , belong to several sub castes and several regions in India . Apart from that the population of people belonging to different Gothras vary widely. For example among Tamil Brahmins the number of people following the Bharadwaja Gothra are about 25% of the population and the people belonging to Agasthya gothra is very less .Another important fact is that There is a kaushika Gothra and a Viswamithra Gothra. The sages indicated by these name is the same sage .I have read some where that Kaushika Gothra was started by the sage when he was a Kshatriya and Viswamithra Gothra was started after he became a Brahmin.Still more perplexing thing is that Lord Hanuman according to a prayer addressed to him belongs to Kaundinya Gothra though nowhere it is mentioned that he is a Brahimn by birth. Ravana is the son of a sage is born to a sage and Rakshasi and I have not come across any Gothra for him. Wikipedia on list of Gothras mentions that there are 46 Gothras among Brahmins.Familypedia gives a list of 136 Gothras, Sri Ramanan has compiled names of about 56 gothras m The world library gives a list of 100 gothras and I have come across a list of 51 Gothras earlier. Please use them and satisfy your Pithrus(manes) who are in Pithru Loka. (Panchami up to 12.12 AM pm (sashti afterwards up to 7.37 am next day ) and Uthara phalguni up to 4.07 am next day and then hastha Nakshatra afterwards ) .